You are a fantastic opera singer now, but what made you decide to become one? Would you tell us how your interests and concerns have changed since finding what you wanted to be, an opera singer? As my case might be rare, the chorus club teacher ignited my potential passion for music, and that I found it what I wanted to do from that day. Looking back, I always had been looking for “something”. I basically love music, but I have no knowledge and experience in the music field. “I just want to do it”. This is the only feeling that led me to my dream. To my surprise, my passion for singing increased day by day. What gives you happiness, delight, and difficulty as an opera singer? Well, I feel so happy when I receive applause and smiles, sometimes tears, various impressions and reactions and when I can share the time with audiences. Furthermore, I have had deep feelings of delight recently when I practice by myself and I have a new awareness through singing, since finding myself with music in my daily life. As time goes on, I have changed my feeling to singing. I’m sure it will be changing in the future. Nothing is hard for me for now. I can concentrate what I love to do, so even if I get troublesome, I forget it shortly (laugh). By the way, I am usually asked, “Do you have any difficulty keeping your physical body and throat in good condition?” Actually, I don’t have any restrictions on myself and enjoy drinking some alcohol. All I do is to take care in the dry winter air. I am not so nervous about it. I enjoy singing everyday, and it is the key to keeping my best condition. Italy is the home of opera. Were you interested in foreign countries before you encountered opera? What is opera to you? Well, I was very interested in foreign countries before I happened to know vocal music. Opera is always challenging beyond my ability. 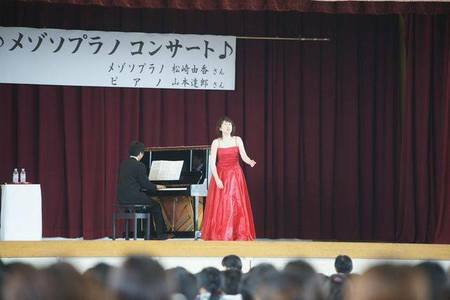 I am now an opera singer, but I was a shy girl who couldn’t even imagine singing in front of audiences before. I am now playing a role and singing on the stage since the encounter with music and opera. I feel that I am expressing myself beyond my ability. Opera was born overseas.We somehow imagine that it is like a non-Japanese actor acting in kabuki – to play a role as an opera singer. Are you conscious oft it? Do you have any special feeling when to express your role as a Japanese singer? That’s true. I have a sense that we, the Japanese, play roles on opera stages and that foreign people learn and play kabuki. I have always faced vocal music (song) by asking myself the role of singing opera as a Japanese singer. Japanese soccer and baseball players are getting popular around the world. If I try to leap onto the world stage like them, I need to believe beyond my ability in the music world and have wider visions and skills as an opera singer. Furthermore, I feel that Japanese “emotional” and delicate expressions are beyond language differences, even if I sing a song in Japanese. I’m sure we can share it with each other. Your weblog and newsletters give a clue to your character and sensitivity. In the art world, sensitivity is certainly required. Do you usually make a conscious effort to cultivate your sensitivity? How do you spend your private time? Do you have any hobby? I spend my time being comfortable and re-charging my energy besides working time. I like to visit somewhere I am interested in, see favorite photo books while listening to healing music in my room, read books, refresh relax . A comfortable cafe nearby has opened recently, I spend a nice time drinking and talking with friendly shop staff after song practice and rehearsal. I have had time recently to think about the relationship between my town and myself. 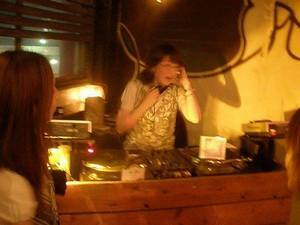 I have various hobbies such as visiting art museums and galleries and playing DJ (Disk jockey) for now. You are required to prepare mentally to do what you love. How did you step ahead towards your dream? In my case, the passion for singing was everything. All fear disappears before performing by concentrating on my favorite things. I am very nervous on many first experiences certainly, but that’s why now I feel much more confident in myself with passion and challenging. So I can tell you that there are two big keys to help your dream come true. One is if you can take time with passion even if you need a long time, and the other one is if you really love yourself working on what you really want to do. If opera doesn’t exist in the world, what would you like to do then? Do you have some future goals and challenges? 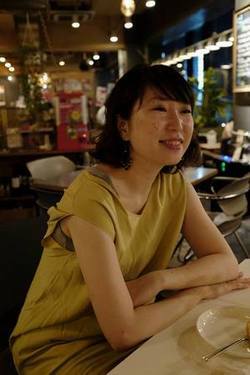 Beyond the art genre as an opera or classical music singer, I would like to try some collaboration with various artists and make works and hold concerts. London culture has inspired my sense since my teens, and I’d like to go to London and do a live performance in an art gallery. While I perform as an opera singer, I also hold breath and voice lessons and workshop to get comfortable daily life and seek ways of expressing individuality for my students. I would like to keep spreading these activities all over Japan. Have you planned and managed your life consciously so far? Yes, I have. I always have had a strong future vision, “I live as a singer absolutely.” I have observed predecessor’s behavior and attitude toward music. What I am conscious of learning from them is always to put in words what and how I want to tell and express, and what I should do to achieve that. Valuing and dealing with ongoing matters of daily life, I bear in mind to take a vision forward to the next step. Do you have any life plans in the future? I would like to keep singing as my life work to express “Music is for life.” It would be wonderful if I would become a symbol person who links world to world by music into later life. Do you have any messages for women who would like to have their dream come true? I’m still on the way my dream, but I have experienced and realized that the first step is always “to tell someone your dream.” Just put your feelings into words if you find something fascinating you, want to do, and wish to do. Don’t hesitate to tell anyone and try to act it out with courage. Something special would be waiting for you! 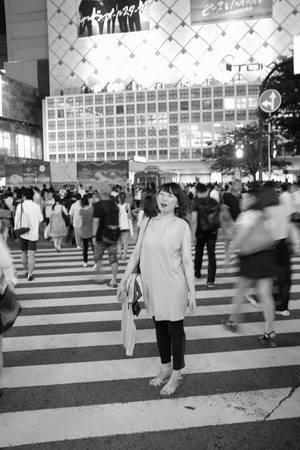 Yuka-san, thank you for sharing your wonderful story!